The French Revolution (1789-1799) was a period of radical political and social upheaval in 18th century France that affected not only France but the entire world. It marked the rise of republics and democracy, and the decline of monarchies and the privileges of church and aristocracy. 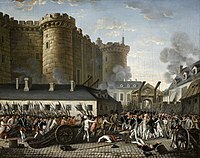 The revolution began on 14 July 1789 when the Paris mob destroyed the Bastille (a royal prison), and ended when Napoleon established the Consulate in 1799. During this time, political power fluctuated between various persons and parties. The revolution was a period of widespread murder, assassination, and legal and illegal execution in France. King Louis XVI and Queen Marie Antoinette died on the guillotine, as well as 40,000 innocent people whose only crimes were being born to the aristocracy. Religious leaders were persecuted and the days of the week were renamed to be more secular. Maximilien Robespierre, the creator of the Reign of Terror, and political leader Georges Danton also died on the guillotine. Political powerhouse Jean-Paul Marat was assassinated in his bathtub by country girl Charlotte Corday. Significant results of the revolution included the end of slavery in French colonies, the expansion of women's rights, the rise of republics and democracies around the world, and the creation of modern France. This page was last edited on 24 August 2016, at 16:59.